At PeoplePulse, we continually invest in our software, delivering enhancements that benefit all clients and maintain our position as leaders in online surveys and reporting. 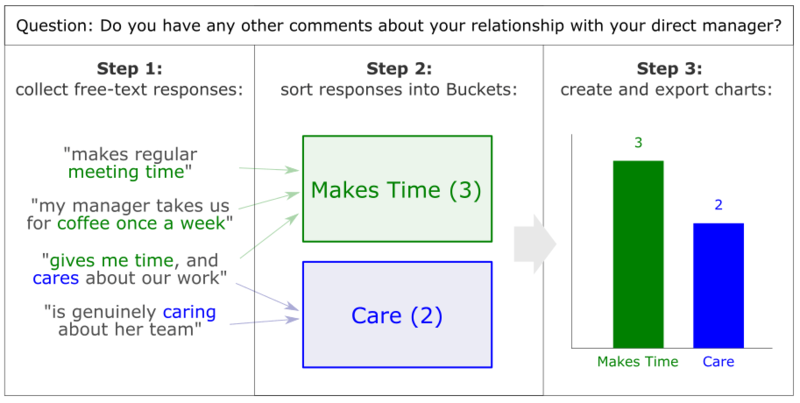 What it is: A powerful analysis tool that enables you to collect free-text responses, categorise them into themes (called ‘buckets’), and share charts showing how many responses fit into each theme. How you benefit: Analysis of free-text can be a slow, manual, offline process … but PeoplePulse ‘Buckets’ changes all that, making it quick and easy. Not only will you save time via the drag+drop interface, but you can gain insights by instantly creating charts and applying survey filters (e.g. Department, State) to reveal trends emerging across various demographic groups. What it is: A new look for our main navigation menus, which have been simplified into three main menus: Surveys, Invites, and Reports. How you benefit: It’s now easier and faster to access our great range of features. All existing functionality has been maintained – plus we’ve added some nice new features to help you navigate around PeoplePulse. What it is: PeoplePulse has been moved to a newer, even more powerful server. How you benefit: The new server will provide PeoplePulse users with increased speed across the entire system, e.g. for running reports, processing invitations, and downloading files. The upgraded environment is also instrumental in allowing the addition of exciting enhancements and features that we are working on. What it is: Share your success instantly with our smart badges that can be placed on your website or intranet to share results in real time. How you benefit: Keep customers / staff engaged with easy access to the latest results, providing a cool way to view and follow progress. The widget also accounts for periods where there is not enough data, so that if results are too low, it is automatically hidden. What it is: Easily run surveys at events and public locations – your surveys can be completed through a tablet or phone. How you benefit: When hosting an event or trying to make your survey easily accessible – our survey links can be access via QR codes on posters, tablets or iPads in common rooms leading to increased participation and response rates. You can still invite via unique email or SMS, but with the added advantage of general access. The feature has been updated to allow unique IDs on emails sent via invites link. What it is: A report to view your own scores and easily track against the aggregate score of your peers. How you benefit: Keep your finger on the pulse to identify if you are in line with your peers and if your organisation is moving in the right direction with the market. NPS results are finally here! Also, this feature has been updated so that you can display a parent-child relationship in the report. What it is: The ability to forward on a partially completed survey to another person to complete. This enhancement is suitable for surveys that need contributions from more than one person at different stages, with data from all parties stored in one response record. How you benefit: Great for when your survey may start with one person, get sent automatically to another person to then review or contribute, and finally submit. Perfect for Employee Nominations, Recognition Surveys, and Employee Reviews. What it is: PeoplePulse now has the ability to automatically pick and upload your CSV Invite file for bulk invitations when saved into an FTP folder, so you don’t need to log into PeoplePulse to trigger your invites. How you benefit: If your organisation has a large volume of invites being sent out on a high frequency (e.g. daily) or if technical / admin capability is limited, the process of uploading the invitations can now be automated – one less thing to worry about getting done on time, every time! What it is: Looking at your responses in PeoplePulse has always been a straightforward process. With this enhancement we added the ability to separate multi-check responses into their own columns when the Responses Report is run. How you benefit: Now that this feature is also available on the Run Report option you can use the Email Report Scheduler to send reports that have the multi-check responses allocated into their own columns. What it is: The Recipient Rules feature has been enhanced so we can now offer this feature at the survey level. This means that invitees for individual surveys can now have rules applied to ensure that they only receive one invite even if they are uploaded to the survey more than once. How you benefit: The Recipient Rules feature means that you can apply rules to ensure your respondents only receive one invite even though they may appear multiple times in your invite list. What it is: Our biggest project since Mobile Surveys, Benchmarking is an exciting new area of PeoplePulse that has just gone live. As we build the benchmark database, clients will be able to compare results across other firms in a similar location, size or industry sector. How you benefit: You will be able to contrast your survey results against how other organisations with a similar profile as you are faring, adding greater context and insight to your own results. What it is: PeoplePulse provides users with the ability to create as many widgets as they like for free! These fully customisable widgets look great and are an effective tool for you to use to communicate your scores via your public website or internal intranet. With scores updated in real-time, the widgets enhancement is one of the most popular features to go live in 2016! 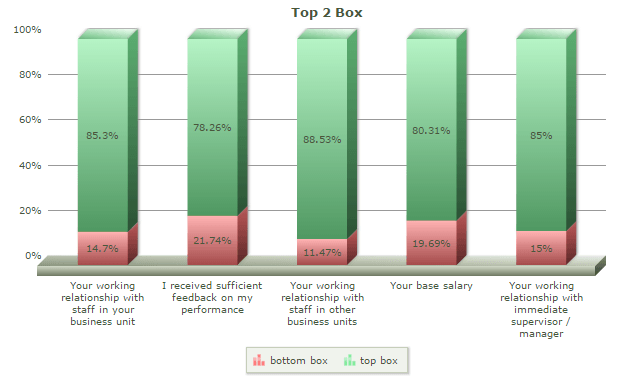 How you benefit: Simple to use, easy to generate, graphic way to showcase your survey results and satisfaction scores in real time on your intranet and/or website. What it is: Our password upgrade means that the password emails you receive when you are setup with a PeoplePulse account will now be generated from the system rather than by a person. This standardises the process and also ensures that you are prompted to create a new password straight away. How you benefit: Improved security because no passwords are emailed and the new user is forced to change their password immediately in order to start using PeoplePulse. What it is: One of the many things we like to help you with is making sure you have a great looking survey design. We recently worked on several enhancements that mean we can do even more when it comes to making your survey design look great. Our save and exit buttons have been upgraded, so too has our button capability and last but not least, we can also change the colour of our scale matrix slider button. 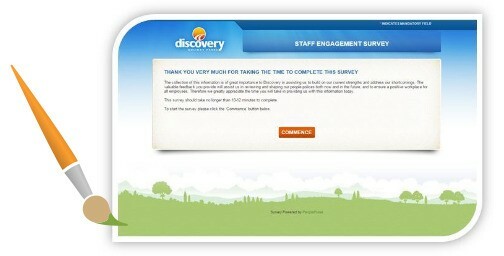 How you benefit: We know people are more likely to respond to a survey when it looks great. Not only that; it is a representation of you and your brand and we take that seriously. What it is: Report training for the Overview Report has been supplemented with a collection of short “how to” videos saved to the help section of PeoplePulse’s Overview Report. 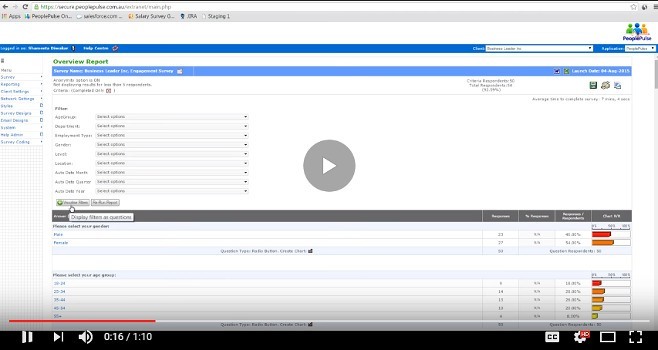 You can access these videos by clicking Reporting > Overview Report > Run your Overview report. Scroll to the bottom of the page and click the video icon ( ). How you benefit: With so many wonderful features within PeoplePulse it can be easy to forget how things work in the Overview Report. The collection of short “how to” videos are quick to view, easy to understand and you can pause and replay them as many times as you need to. What it is: PeoplePulse now offers a straightforward way to embed our key ‘Overview Report’ directly into your public website or internal intranet. You can use this new functionality to embed entire reports or single questions into your website, intranet, or your dashboards. 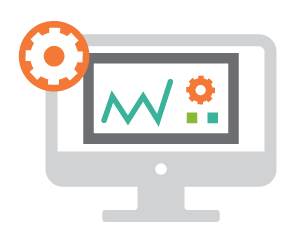 All embedded reports regularly update so there is no need for any manual intervention to ensure your audience see the latest survey results. Add Customer Satisfaction scores into your sales websites as tangible reinforcement of the perceived value of your products or services. What it is: Ever wondered, “For each person who scored us a low score for question X, how did that person answer the rest of the survey?” Now it’s easy to get that answer. How you benefit:PeoplePulse’s new ‘Individual Responses’ view (accessed via the Overview Report) provides granular detail about individual responses. Now you can easily click through and read the entire survey response submitted by an individual person, without having to run a separate report. … and you can continue to use filters to drill down and get an even more detailed view about specific areas. What it is: PeoplePulse’s default link for mobile surveys are now short links of 21 characters, included in that 21 characters is a shorter survey-specific URL: survey.qa. How you benefit: Typically a survey link can be quite long (75-100+ characters). When you are sending SMS invites, you only have a limited number of characters (160). We’ve found this feature to be efficient and saves time, money, and freed up space to promote your survey within the SMS invites you send out. 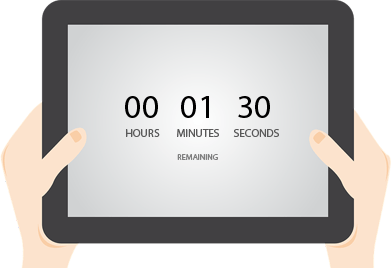 What it is: In kiosk mode, when the survey is idle for a pre-determined amount of time the respondent is asked to interact with the survey or else the survey will automatically reset back to the beginning. How you benefit: When your survey recipients don’t have access to their own computer and you don’t have their mobile numbers, PeoplePulse’s kiosk survey solution will help you reach them in a communal setting in a user friendly way. 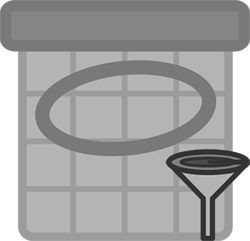 What it is: Now you can schedule to automatically send and receive regular emailed reports. This means your survey results can be emailed to you on a regular basis (daily, weekly, monthly or quarterly) without you having to lift a finger. How you benefit: We love this feature because it means we are able to help you make your data even more accessible to you. Receiving a quarterly email of key staff or customer survey results, for example, is often a more effective way to keep your finger on the pulse than trying to remember to login and run reports. What it is: Long lists on mobile and tablets are daunting and difficult for survey respondents to fill out. As such we’ve implemented dropdown text boxes with a neat autotype feature. Start to type and the answer options begin to auto-fill with possible answer choices. How you benefit: Text boxes that auto-fill speed up response time and ensure that people don’t exit the survey because of tedious scrolling issues or difficulty in reading the questions. 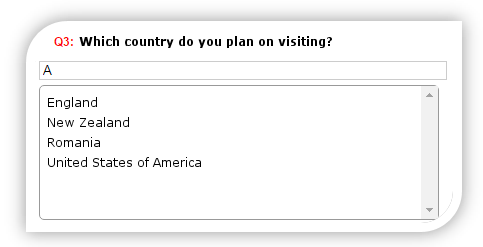 This works particularly well when the list of answer options are all known. 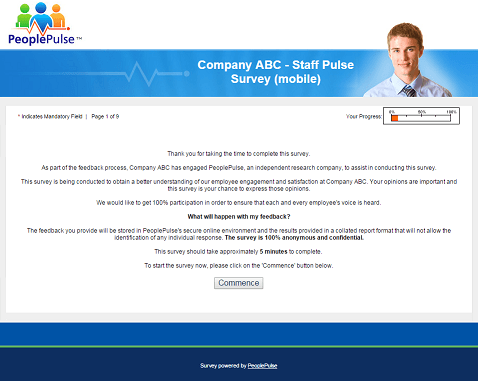 What it is: Create one survey and have the design and question structure optimised for desktops, mobiles and tablets. Providing three different methods for the survey respondent to answer survey questions also increases the probability of participation. How you benefit: Response rates increase because the survey looks good and is easy to respond to no matter what device the recipient chooses to work on: desktop, mobile and tablet. Survey data is collected into one database which makes reporting simple and straightforward. And there is no need to replicate or build the survey multiple times which means you can spend the time you save analysing the data as it comes in. What it is: We’ve added the ability to stack charts in our top box report; this means for any scored question, you can see the top and bottom scores merged into one stacked (traffic light) chart. We’ve gone one step further and made it so that you can compare multiple stacked charts on the one chart. 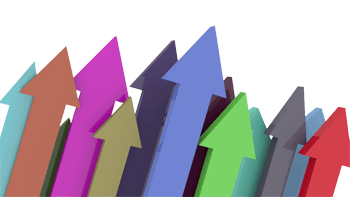 How you benefit: Choosing the stack chart option from the top box report will mean that you are able to compare the full value set for your top or bottom scored questions. This saves you time because the information is all in one place, on one chart. What it is: PeoplePulse automatically captures certain data each time a survey response is captured – this feature can be turned on or off. We can set this to the financial year that you use so that when you trend over time, the periods used are based on your specific financial year. How you benefit: Trending over time is now a lot easier and there is no longer a need for us to continue to capture date ranges in our preloaded fields. We can make the reports even more relevant by tailoring periods to our financial year. This feature helps make your reports look more professional and relevant. What it is: Dynamic design skins provide the ability to customise the design for each brand so that each recipient receives the survey couched in the brand that is most relevant to them. How you benefit: Dynamic Design Skins enable you to deliver a survey experience with a brand identity relevant to the recipient which reinforces in a subtle way that you care about their opinions without you having to create multiple different surveys. And by keeping survey responses all in one database there is no need to use extra tools to combine the data which makes reporting so much simpler. What it is: We’re all about simplifying things and so we’ve made sure that our translations into other languages now accommodate the system messages and section headers. Translations into other languages can be paired with our dynamic design skins feature so the survey respondent recognises and understands the language but also allows the design to be consistent. How you benefit: Sending out a survey in a different language and then having a system message appear in a different language is just like someone singing in the wrong note! It’s jarring and can take away from the impression that you really care. This is another way that a company can communicate that they genuinely care by taking the time to deliver them a relevant experience. 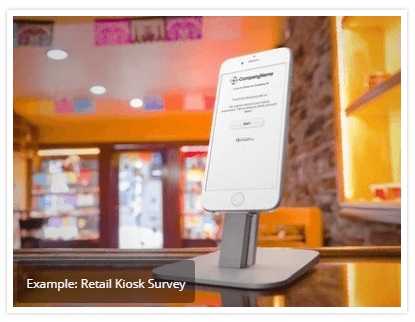 What it is: Some clients want to run a paper survey alongside their online / mobile / kiosk surveys. Pulling these together in a way that looks good has been made a lot simpler with our upgraded Word export feature. How you benefit: With the click of a button, we can download your online survey into Word. With some minor changes (simply because we are that fussy) we can produce a paper survey for those clients who require them. The CSV extract from the Responses Report has been optimised to run faster across large data loads. The Filter Comparison report – now greys out surveys that don’t contain filters – if you don’t have any filters have a chat to your PeoplePulse Project Manager so we can teach you how to use these. Chrome, IE and Firefox have all upgraded during the past 6 months and we have kept PeoplePulse up to date with these updates. PeoplePulse charts have also been upgraded to work with HTML5. What it is: If you have filters (either preloaded or filters tagged as a question) included in your survey you can now choose to hide them from the recipient of an emailed report. How you benefit: If you want to share your data via email, but HIDE the filter drop down boxes to ensure the report looks clean and that the recipient isn’t distracted by data that doesn’t relate to them, now you can! What it is: Streamline your processes today: you are now able to integrate PeoplePulse with your internal Business Intelligence and CRM systems! How you benefit: The PeoplePulse API v1 allows you to pull into your systems the latest responses to a single question, or all questions in a survey, in the widely popular JSON format. This allows you the ability to keep your database automatically updated, or push survey data onto your own website or intranet. The list above is just a selection of recent enhancements. To learn more about our extensive range of features, request a free demo or call us on +61 2 9232 0172. If you’d like to see a list of older enhancements, click here.